The Internet is the term used to identify the massive interconnection of computer networks around the world. It refers to the physical connection of the paths between two or more computers. The World Wide Web is the general name for accessing the Internet via HTTP, thus WWW.anything.com. It is just one of the connection protocols that are available in the internet and not the only one. When you refer to the internet, you are referring to the hardware connections. 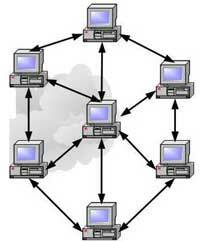 It is made up of the computers, cables, routers, switches, repeaters, and many more that make up the entire network. It is the physical layer on which multiple protocols are in use to facilitate data all around the world. Some of the protocols that are running on the internet might not be as popular as the WWW but for sure most of us have used these protocols one way or another. Email applications do not make use of the WWW to transmit data over the internet since they have their own protocol known as SMTP, POP, and IMAP. IP Phones that are used to make calls over the internet have their own VoIP protocols and have no need for the WWW. The World Wide Web is simply another application that runs on top of the internet. Servers house web sites which you can visit with the use of your browser using the HTTP protocol. You can then browse through the site via Hyperlinks that take you from one page to another and even to pages on another site. It is a very common mistake for most people to treat the internet and WWW as if they were interchangeable, although it can be argued that the WWW is the most popular method of using the internet. Whenever you are using an internet browser, it is likely that you are accessing the WWW. You can check if you are by checking on the address bar and see if http or https is listed first. If you see FTP or any other acronym in there, you are not on the World Wide Web. 4. The Internet and the World Wide Web are not synonymous although most users treat them as such. Ben Joan. "Difference Between Internet and World Wide Web." DifferenceBetween.net. August 29, 2017 < http://www.differencebetween.net/technology/difference-between-internet-and-world-wide-web/ >. my name is Abdulghani Haqmal . The Internet is the term used to identify the massive interconnection of computer networks around the world. It refers to the physical connection of the paths between two or more computers. The World Wide Web is the general name for accessing the Internet via HTTP. It is just one of the connection protocols that are available in the internet and not the only one.